Do You Have What It Takes To Change Careers? 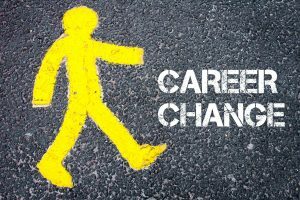 You say you are determined to live up to your career potential, and changing careers is the way to make it happen. Great! Then, prepare to be a high-flier – someone who does not settle for less, pushes boundaries, and is motivated by goals that others nay-say as unrealistic or unachievable. High-fliers constantly stretch themselves. They set high goals, and are not afraid to ask others for help. 1. What are you willing to invest? 2. How much are you willing to tolerate? Most of us like to be comfortable. But if you put your mind to being a high-flier, you may well have to prepare mentally to push out of that comfort zone to reach your long-term goals. You may need to give up things that cost you more money than you can afford while going back to school or doing an internship. You may need to sacrifice time with something else you like – making top priority whatever it is that will help you reach your long-term goal. 4. Are you willing to start where you are? My client, Peg, was moving from software programmer, to a degree in global logistics. She realized she needed to learn about manufacturing, distribution, and supply chain management in a real-world setting. She was willing to do an unpaid internship to get it. You can always get where you want to go, providing you’re willing to start from where you are. And your high goal can only become real when you’re willing to take the first small step. High goals – including complete career change – can be reached. In the process, high-fliers don’t focus on what they’ve done, but what they are becoming. The bonus is that in doing so, they have the steady delight of grasping progressively higher intermediate goals in the daily experience and preparation. Barb Poole, President of Hire Imaging, LLC, http://hireimaging.com/ is a certified career strategist, coach and writer who has helped people explore, find, get and keep career dreams for 30 years!